Just as the publication of John Ashbery’s The Double Dream of Spring (1970) helped to cement the poet’s post-Tennis Court Oath reputation, the double presence of Ashbery’s papers (at Houghton Library) and his personal reading library (to be overseen by the Woodberry Poetry Room) promises to do the same for generations to come. 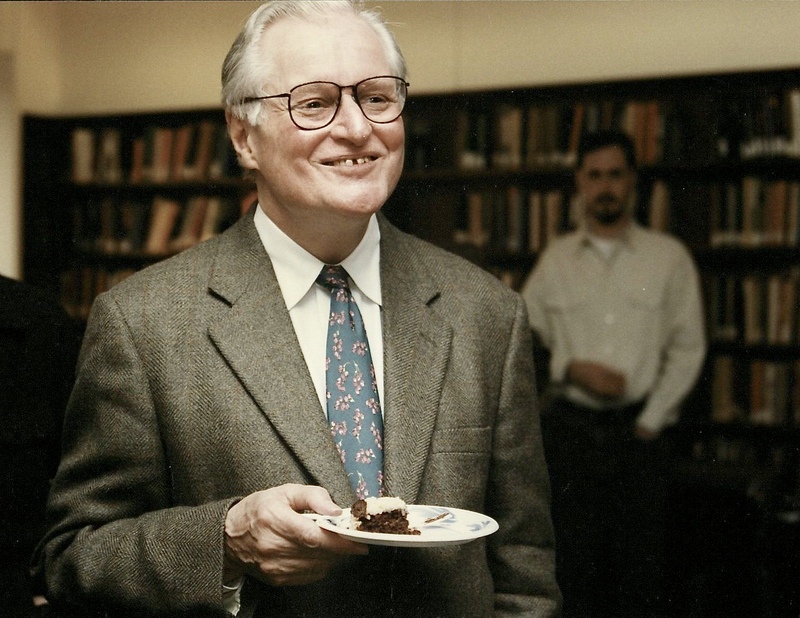 The recent gift of the John Ashbery Reading Library by his husband, David Kermani, combined with Houghton Library’s acquisition of the last portion of Ashbery’s papers, will make Harvard a vital center for future studies of Ashbery, offering scholars the holistic opportunity to consult the totality of poems he wrote alongside the personal pantheon of works that he read. Houghton Library’s acquisition of Ashbery’s manuscripts and correspondence began over 30 years ago, in 1986, and the final posthumous shipment of papers occurred in December 2018. 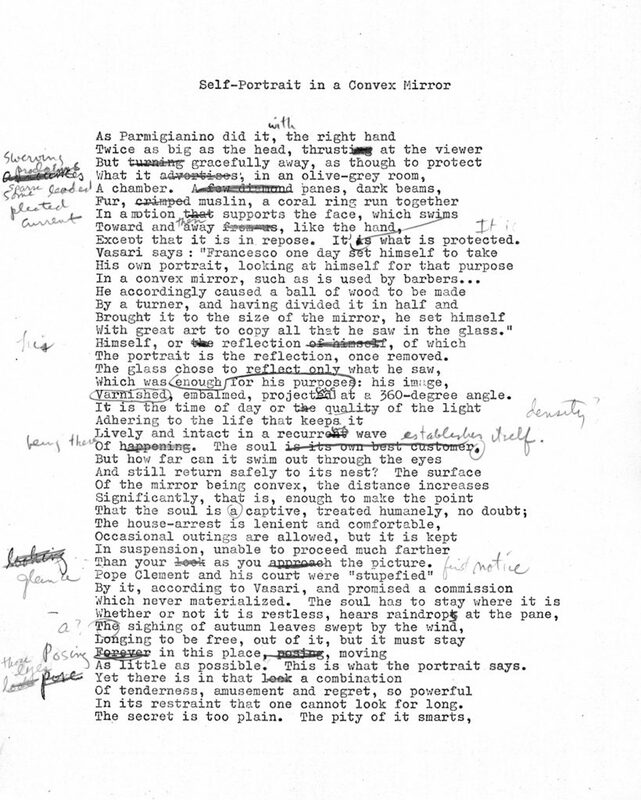 Occupying more than 250 linear feet of shelf space, the papers include manuscripts of all of Ashbery’s works, from Some Trees to Commotion of the Birds: New Poems, including multiple working drafts. John Ashbery. “Self-Portrait in a Convex Mirror,” typescript with autograph changes, ca. 1974. John Ashbery papers, Houghton Library, Harvard University. 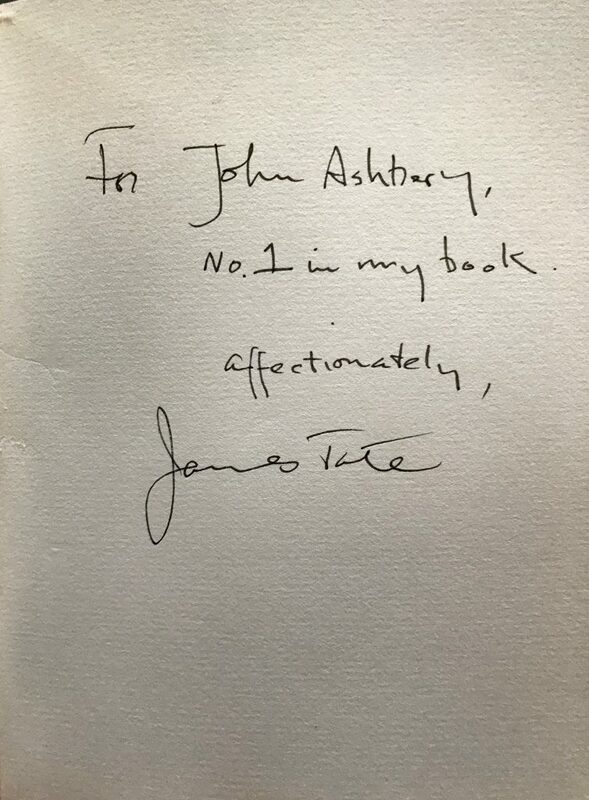 © 1974, 1975, 1985, 2008, 2019 Estate of John Ashbery. All rights reserved. Shortly after Ashbery’s death in 2017, David Kermani approached the Woodberry Poetry Room with the generous offer to donate Ashbery’s extensive library to its collection. The John Ashbery Reading Library, which will be housed at Houghton and overseen by the Poetry Room, constitutes over 5,000 books of poetry and literature, art and film criticism, architectural history, philosophical and religious inquiry, travel literature, “gayellow pages,” and cookbooks collected by Ashbery over the course of his lifetime. John Ashbery’s copy of The Oxford Book of American Verse, with pressed flowers. Courtesy of the Woodberry Poetry Room, Harvard University. The donation also includes selected objects—among them, one of Ashbery’s typewriters and the collage, “Children at Play,” that hung above his Chelsea writing desk for over 25 years. Once cataloged, these items, as well as selections from his substantive pottery collection, will be on view periodically in the WPR curator’s office and will be permanently available to visiting scholars on request. Ashbery’s reading library is not only a compelling showcase of his eclectic and enduring curiosities but stands, in many ways, as one of his consummate works of art, one that he constructed with great care over the course of many decades. During his lifetime, it was also a vital artery in his writing life and served as a kind of early and intimate Internet, from which he drew ideas and felicitous bits of data on a regular basis. Even the makeshift bookmarks that Ashbery used (including fortune-cookie slips and smoking-section airline tix) offer insights and delights, as do such call-and-reply marginalia as this one—from a book called Lyric Voices: Approaches to the Poetry of Contemporary Song. Many of the books feature illuminating marginal markings and inserts, as well as affectionate and whimsical inscriptions from such friends as Robert Duncan, Ronaldo Jonson, Kenneth Koch, Harry Mathews, Tom Raworth, Mark Strand, Trevor Winkfield, and Dara Wier. Ashbery’s reading library will be housed in Houghton Library, where it will join such personal libraries as those of Emily Dickinson and Maurice Blanchot. In addition to the reading library, the Poetry Room has helped coordinate Kermani’s donation of one of Ashbery’s desks to Harvard University. Through a collaboration with Adams House, and with the generous support of the family of Seamus Heaney, Ashbery’s beloved “Lawrence desk” (the desk he inherited from his grandfather Henry Lawrence) will be installed in Adam House’s Heaney Suite, where undergraduates will be encouraged to create their own works. According to Karin Roffman, beginning in 1945, John was “a constant presence in the Poetry Room, listening to its vast collection of poets reading their own work….” Ashbery even gave his first poetry reading in the Poetry Room‘s original Georgian-style venue in Widener Library. He was also an avid borrower from its collection. Witness his compelling response to an overdue notice (circa 1946) for a book by W. H. Auden, a poet who would later choose his first book, Some Trees (1956), for publication. 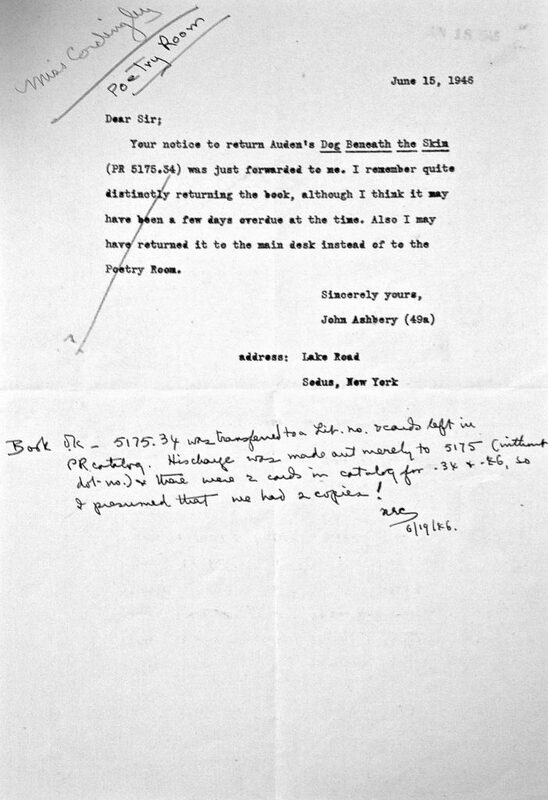 Letter in response to overdue notice to John Ashbery (1946). 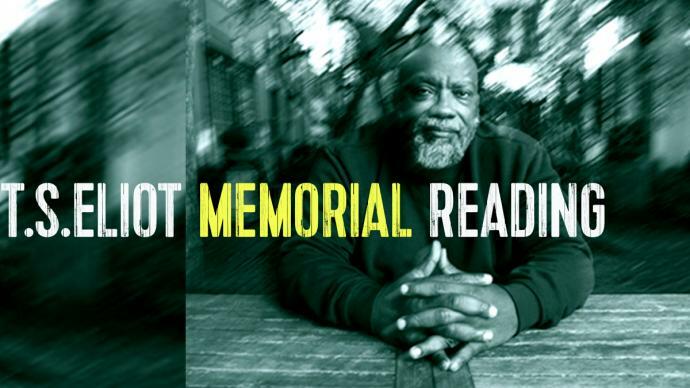 Courtesy of the Woodberry Poetry Room records. In 1951, Ashbery (indirectly) renewed his connection with the library, when he returned to Cambridge for the Poets’ Theatre production of his one-act play Everyman and to perform the role of “John” in his classmate Frank O’Hara’s Try! Try! 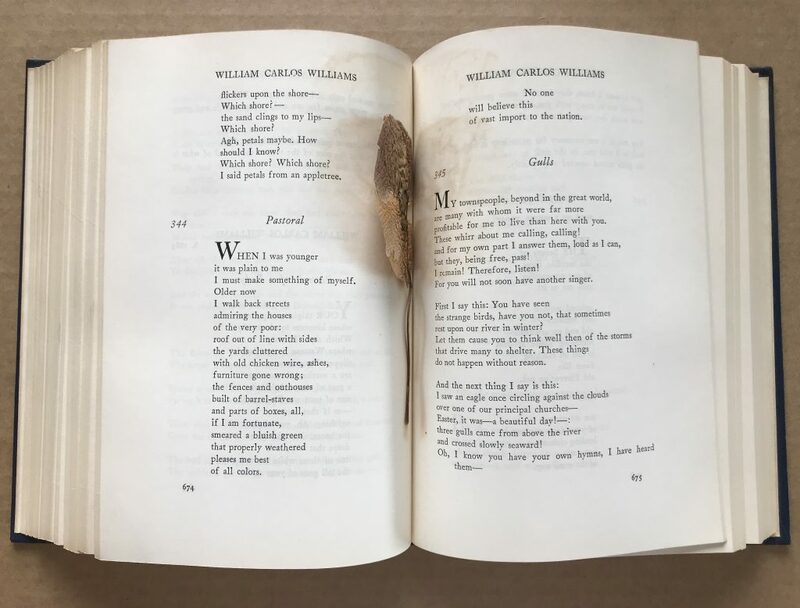 Try!—both of which were recorded and preserved by the Poetry Room. This recording constitutes the earliest extant recording by John Ashbery. 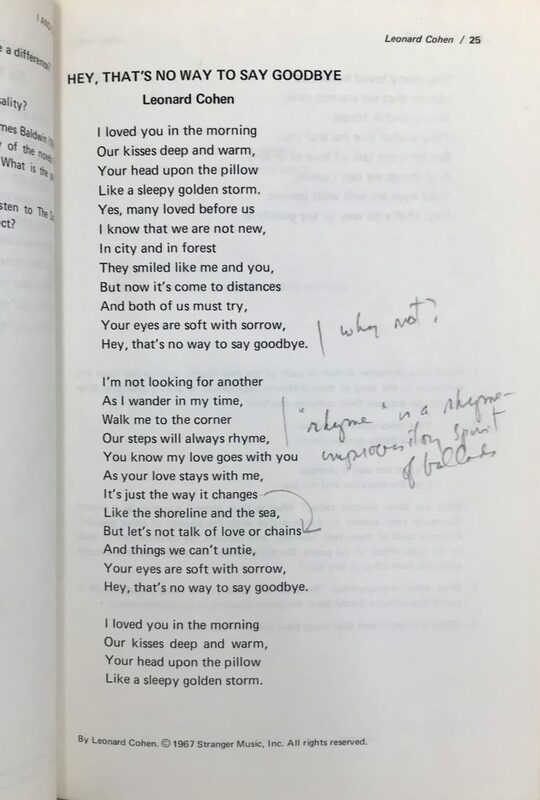 As his reputation grew, Ashbery was generous with his visits to his alma mater and to the Poetry Room, which in turn recorded and preserved over a dozen readings/presentations by Ashbery, including his Norton Lectures (notes and jottings for which can be found sprinkled throughout the reading library). More recently, the Poetry Room has worked to preserve such films as John Latouche’s “Presenting Jane” (1952) (featuring appearances by John Ashbery, Frank O’Hara, James Schuyler, and Jane Freilicher), which was donated to the collection by Harrison Starr in 2014. 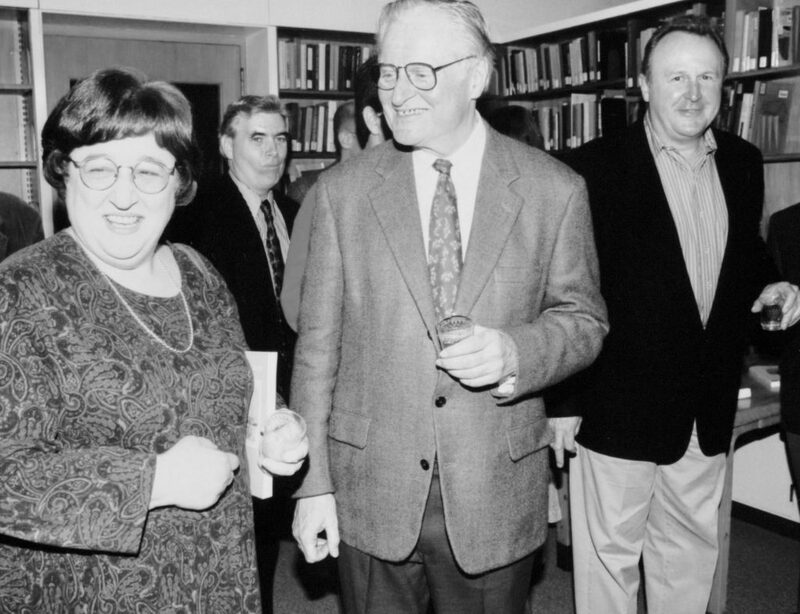 John Ashbery’s 70th birthday celebration at the Poetry Room in 1997, with Prof. Helen Vendler (left) and the late Bill Corbett (right). Courtesy of the Woodberry Poetry Room, Harvard University. The Poetry Room and Houghton Library are honored to continue this long and steadfast accompaniment of Ashbery’s work into the future. P.S. : Lest we be Harvard-centric when it comes to someone as magnanimous and immense as John Ashbery, I should emphasize that the Beinecke Library at Yale University is also a significant center for Ashbery studies. I encourage you to visit the innovative digital humanities resource, “John Ashbery’s Nest,” created by Karin Roffman, in conjunction with the Yale Digital Humanities Lab. 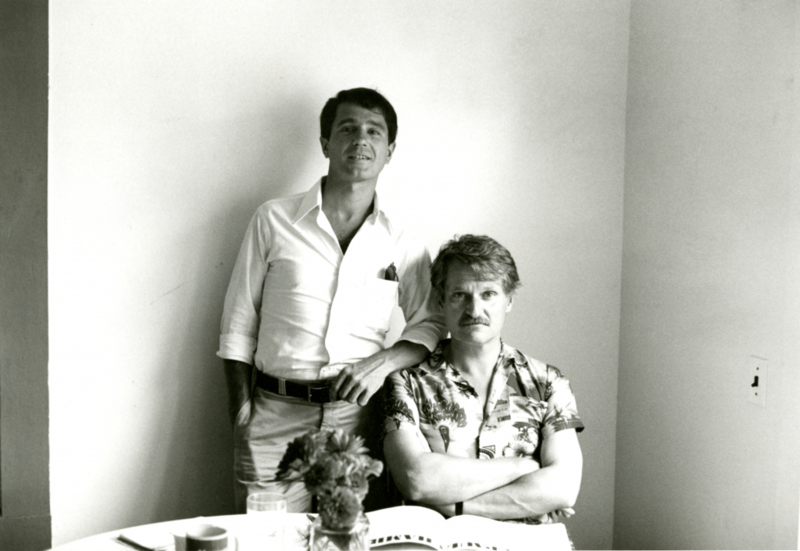 In addition, the Ashbery Resource Center, an archival and research facility located in Hudson, New York (and overseen by literary dynamo Jeffrey Lependorf), is also a revelatory resource, featuring Ashbery and Kermani’s extensive collection of the poet’s works in print. Cover image: John Ashbery’s 70th birthday celebration at the Woodberry Poetry Room, 1997. Courtesy of the Woodberry Poetry Room, Harvard University.